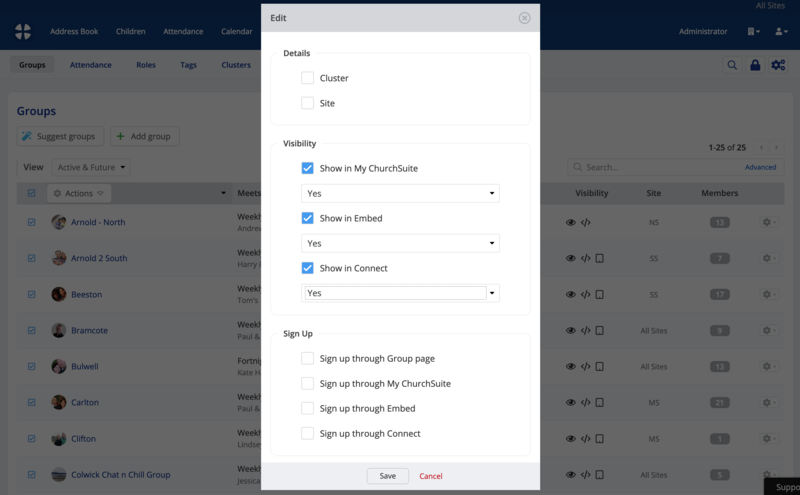 You can easily manage the visibility of small groups, to determine whether each group is visible in My ChurchSuite, Connect (in the Group List application running on a device at your weekend service Information point) or the Embed Lists/Maps of small groups that you can embed into your church's website. For any small group to be visible in My ChurchSuite, the My Groups menu must first be enabled. To do this, head into your Small Groups module options (via the cog-wheel in the top right hand corner of the screen - you'll need Administrator or Manage module permission to do this). Select the My ChurchSuite Options tab and tick the option to Enable My ChurchSuite access. This will turn on the My Groups menu for your church members in My ChurchSuite. To set the visibility of a small group, head into the Groups section of the Small Groups module, select to Edit a group in the list from the cog actions menu on the right. Scroll down the group's page to the Visibility section. 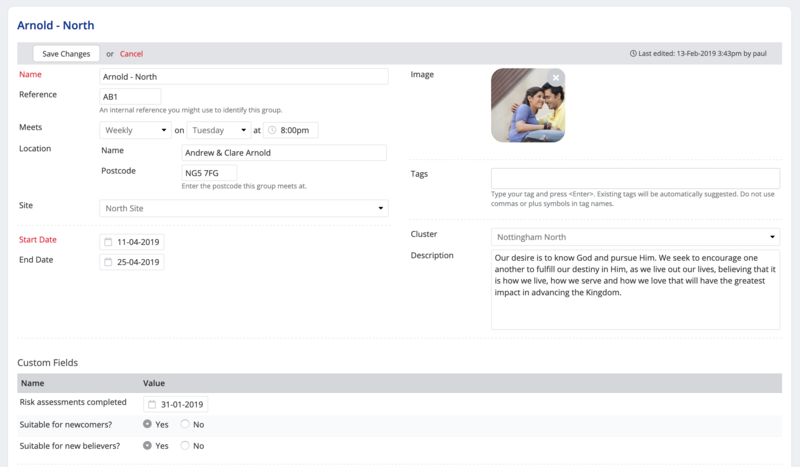 Select to show the group in My ChurchSuite, Embed and/or Connect as desired. Save any changes made before navigating away from the page. Now, when viewing the group's page in the Small Groups module, notice that group's visibilty settings are indicated. the eye symbol indicates Visible in My ChurchSuite. The group will only be visible to the group's members. If group sign-up is enabled and open, the group will also show in the Sign-Up section on the My Groups page. Unlike Embed, My ChurchSuite only shows groups that have sign-up enabled. the </> symbol indicates Visible in Embed (on any embedded small group List/Map on your website). All Active groups (and Future groups, if enabled in the module's options) show in the embed, even if sign-up is not yet open. the tablet symbol indicates Visible in Connect. 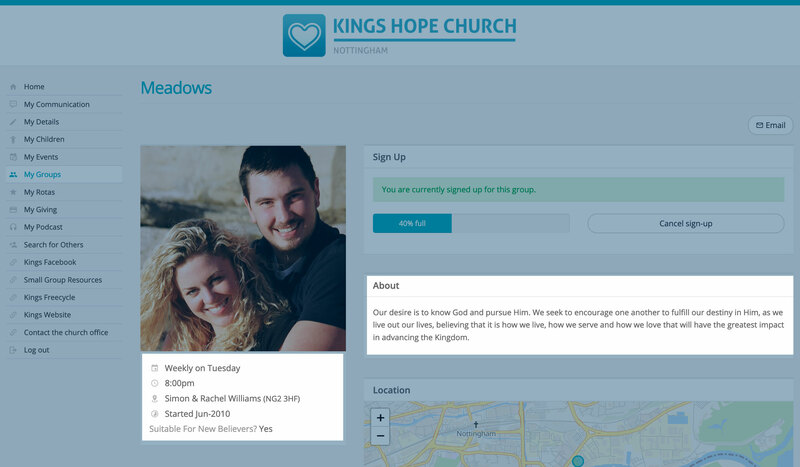 Connect includes the Group List application, which can be used to help people view a menu of your church's Active small groups (and Future groups, if enabled in the module's options) on a laptop or tablet running at your church Information point. This can be especially helpful for those without access to My ChurchSuite or unable to access your church's website at home. 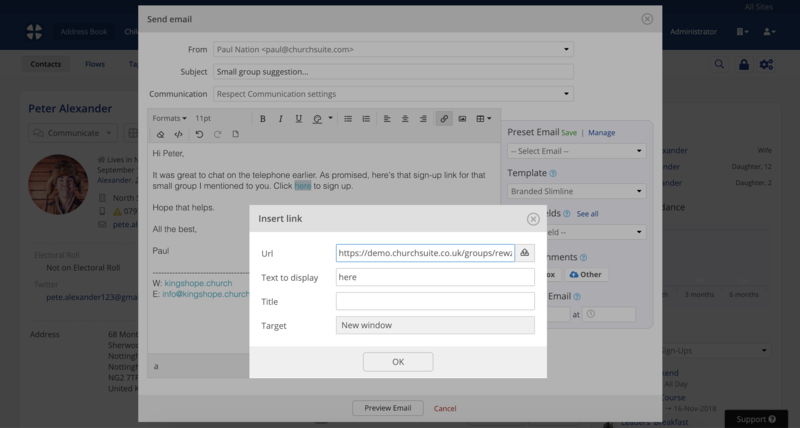 See the related support articles for how to enable and customise the small group sign-up feature for your small groups. You can use the batch actions feature to make visibility changes to multiple, or even all small groups. 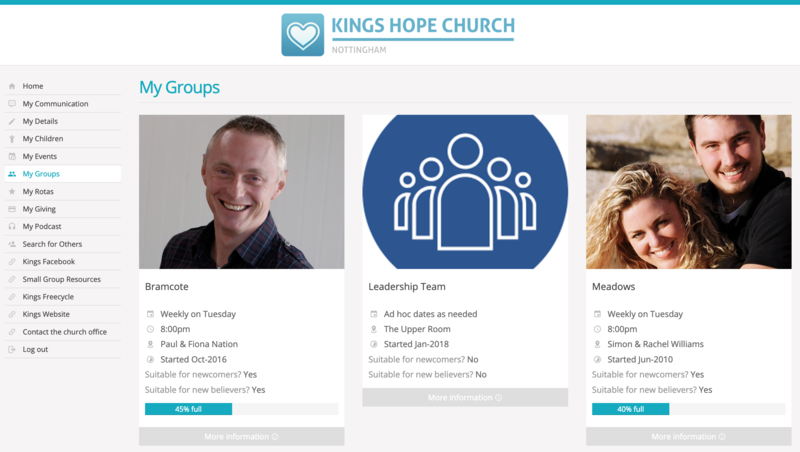 Head to the Groups section of the Small Groups module. Tick the checkbox of each group in the list for which you want to make visibility changes. From the drop-down batch Actions menu, select Edit. In the Edit pop-up, tick and select the Visibility options as required. Notice also the other batch action options available for group Details and Sign Up. Scroll to the bottom of the pop-up window. The list of groups that will be updated is listed. Type I CONFIRM and then click Save to process the visibility changes to all the selected groups. In addition to managing the visibility of small groups, you can also manage the visibility of each group's meeting details, running dates and group description (see screenshot below), and also optionally make visible certain small group custom fields on the member/public-facing group page that people see in My ChurchSuite, Connect and Embed. Visibility of these group details is a module setting that applies to all small groups that are set as visible in My ChurchSuite, Connect and Embed - it's not possible to control the visibility of group meeting details, group run dates, group description and custom fields on a group-by-group basis. To change the visibility settings for these fields of information, head into the Small Groups module settings via the cog-wheels icon in the top-right corner of the module - you'll need manage module or Administrator permission to do this. Once there, select in turn, the My ChurchSuite Options tab and then the Embed Options tab to complete the steps outlined below. 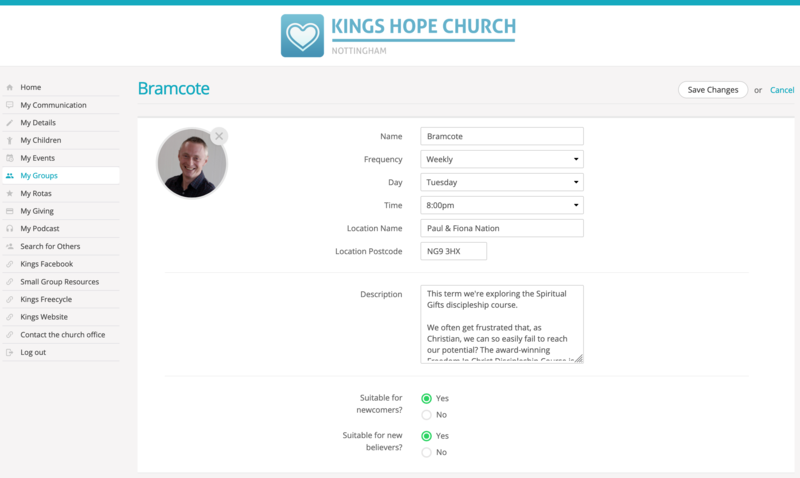 On both the My ChurchSuite Options tab and the Embed Options tab, scroll down to the Details Visible section and tick to hide (or un-tick to show) each field of information as desired. The settings on the Embed Options tab appy to groups visible in Connect and Embed - both feautres share the same group pages and therefore share a common setting for the Details Visible. However you can set different visibility settings for group details in My ChurchSuite - in this way you can Hide the meeting details on your public-facing website and church Information point, while having group details visible to your church members in My ChurchSuite. Meeting details - this is the group's meeting day and frequency, the meeting time and the meeting location name (if specified), or the meeting postcode, if location name is blank. Dates - this is the group's active running dates (from and to). The colour of the dates shown on the group page will change automatically depending on the group's status - green for groups that have not yet started (but have sign-up open), black for active groups that are currently running, and red if the group is ending in the next month. Once a group has ended it ceases to be visible in My ChurchSuite, Connect and Embed. Description - this is the group description, often used to inform potential sign-ups about the group's vision, purpose or theme, and who the group might be suitable for. The group's description shows in the "About" section on the group page (see the group page screenshot example at the start of this section). As illustrated in the example group page below, you can optionally make certain small group custom fields visible on group pages. For example, if you had a small group custom field for "Suitable for new believers? YES/NO" or "Suitable for newcomers? YES/NO" - you can make that information visible to those who are viewing the group page through My ChurchSuite, Connect, and website Embed. Of course, some custom fields may be internal-use and will not be set visible. Begin by adding the small group custom fields. Navigate into the Small Groups module options. Click on the Module tab. Scroll down to the Custom Fields section and add your custom fields as required - see our related support article for further information about creating custom fields. Save your changes before navigating away from the module settings. Next, edit each small group in turn and assign the appropriate custom field options for the group - notice the Custom Fields section under the group details. 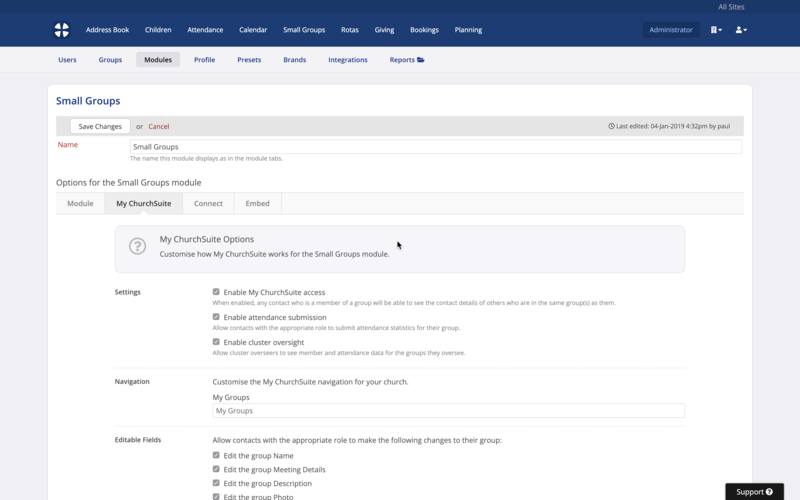 Head back in to the Small Groups module options and select the My ChurchSuite options tab. Scroll down the options page to the Custom Fields section. Tick to set custom fields Viewable by contact as required. You also have the option to set custom fields Editable, meaning that small group members whose group role permissions include Edit group details (e.g. a Leader role) are able to manage custom field options for their group along with all the other group details they can edit (see previous section). In the example below, custom fields 2 and 3 will be visisble on the group's page in My ChurchSuite, and small group leaders with Edit group details permissions are able to manage the settings for custom fields 2 and 3 as part of managing all their group's details and group member list. Custom field 1 is not visible or editable in My ChurchSuite - it's an internal-use field onlu visible within your Small Groups module. Embed and Connect share the same group page settings. This is because those accessing a small group's page through your website or through Connect's "Group List" application running at your church Information point are essentially seeing the same public-facing group page. To set small group custom fields to be visible on group pages, head back in to the Small Groups module options and select the Embed tab. Scroll down the page to the Custom Fields section. Tick to set custom fields Visible as required. 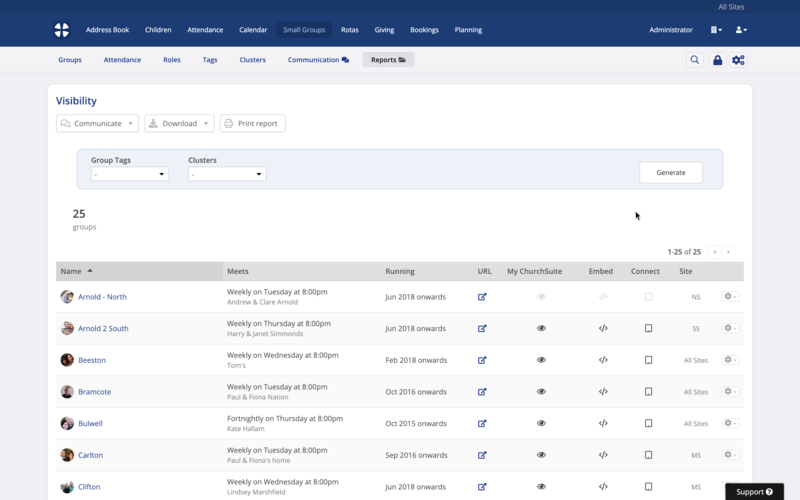 In the example below, Custom Fields 2 and 3 will be visible on the group page in Small Group Embed on your website and in the Group List application in Connect. Custom Field 1 will not be visible - it's an internal-use field on visible within your Small Groups module. Remember to save any changes made to module settings before navigating away from the page. Each small group has a member/public-facing Group Page with its own unique URL. You can preview the group page at any time; simply click the Go to group page button. 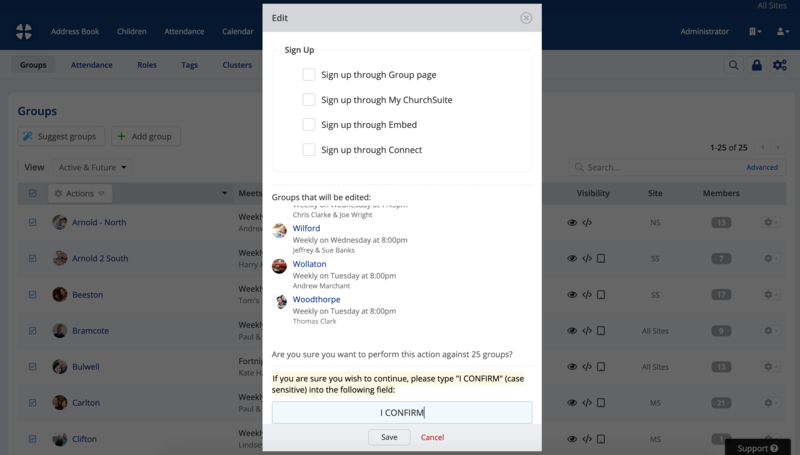 For groups set to be visible in My ChurchSuite, Connect and Embed - regardless of whether group sign-up is enabled - the Group Page is what people will see when they click through to the group, and it's this same group page URL that can easily be distributed in your communications. The most obvious use of the Group Page URL is to copy/paste or embed the link into your email communications; or pasted into your social media pages. In the example below, the HTML Insert/edit link tool is being used to embed the group page URL in an email, so that when the recipient of the email clicks "here" the group page is opened in a new browser window. This paste/embed method also has the distinct advantage of allowing those who may not be in your Address Book to access the group page (and sign-up where applicable) when you share it using an external email application outside of ChurchSuite. For example, the event page URL can just as easily be embedded into a MailChimp campaign communication or embedded behind a button or link on your website. For added security you may want to use a temporary URL site to create a 'time-restricted link', and therefore minimise the risk of your contacts sharing the link and using it. For more information about this have a look at this article. In addition to sharing or distributing the group page URL, you can also share group page to Facebook and Twitter - simply select as appropriate from the Share button menun at the top of the group's page. You can view, and even edit the visibility of all of your Active small groups using the Visibility report in the Small Groups module Reports section. You can filter the report by Group Tags and Clusters - click Generate to apply the filters. You can change the visibility settings of any small group in the report results by simply clicking the visibility setting icon. Like small group batch actions (explained earlier), this report essentially saves you having to open and edit each individual group and enables you to make multiple changes to the visibility settings of lots of groups really quickly! Note also the URL column - ideal for quickly navigating to the public-facing Group Page for any Active group, without having to open each group one at a time. Right-click on the URL icon and select Copy Link Address - you can then paste that group page URL wherever you choose - ideal for grabbing multiple group page URLs to drop in to your e-newsletter.